Yes, It’s Coming To Pratt Homes Soon! A Modern Look With A Monoslope Roof. This new home will be arriving soon at Pratt Homes in Tyler, TX, and we wanted to be the first to bring you all the exciting details. 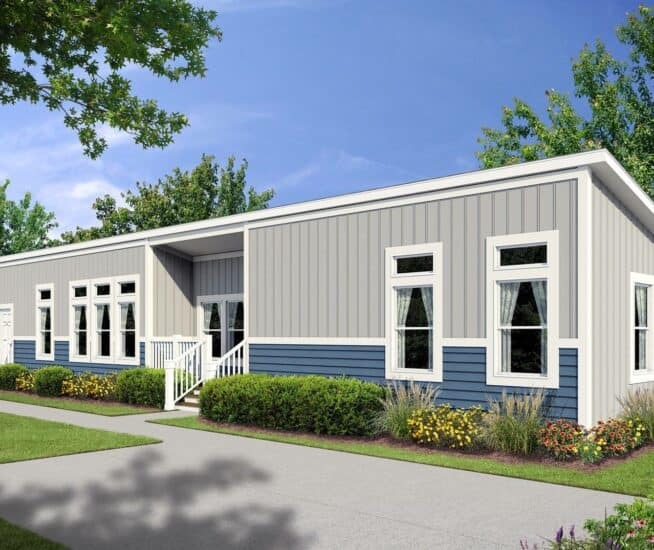 A mono-slope (or one slope) roof design is one of the most sought after and requested designs in manufactured homes and tiny home Park Models today. The clean lines and modern look of this new home will surely add curb appeal to your homesite. Let your roof offer more than just add protection overhead. This home not only boasts an updated and modern look to the outside facade, but the floorplan of this three bedrooms/ two bath (3/2) home brings an open and airy feel inside. The home’s layout makes efficient use of important living space. At 1,090 sq. Feet, this new model uses plenty of windows throughout the home to bring in the natural light and create a spacious feel. The master bedroom is separated from the other 2 bedrooms and also features an en-suite bathroom for both convenience and privacy. The dual vanity sinks offer ample space and even greater convenience. And, don’t forget to ask about the options available for either a shower/tub combination of an oversized walk-in shower. Options galore exist with this new model, so you can customize your home to fit your family’s lifestyle. Our in-house design team can help you get started. This new home provides additional options for the homeowner, so you can make your home, truly yours. Standard amenities with a Pratt Manufactured Home far exceed what you will find with many other companies. When looking for a new mobile home, trailer, manufactured home, or new modular home, remember to consider the monetary value and importance of quality of living, resale value, energy efficiency and related costs, and windstorm ratings. At Pratt Modular Homes, our standard amenities, quality materials and craftsmanship, and customer service will always “Cost” less when compared to what other builders offer in the building process. Stop by Pratt Homes today on Loop 323 in Tyler, and see for yourself how we have built a stellar reputation based on quality construction and top notch customer service. At Pratt Homes, we will meet, and even EXCEED your expectations! Interested in Financing Your New Home? Do you need more information about financing options for your new manufactured home? We can show you how easy it is to secure financing through our in-house finance department. We will be happy to explain all the different types of loans and programs available to our customers. We are often asked, “Do I need land before I purchase a manufactured or modular home? At Pratt Homes, we have an in-house real estate broker that can help you locate property. We also have land developers who provide us with available properties throughout Texas, Oklahoma, Louisiana, and Arkansas. So, whether you are looking to build a new home nearby in Tyler or Longview, or perhaps across state lines, we can help you find the perfect location. Take a look at what one of our satisfied customers had to say about their experience with becoming a Pratt Homeowner. “After researching for several months, I purchased my Park Model Tiny Home from Lynn Pratt, and the entire process was seamless. The follow-up and attention to detail have been second to none. 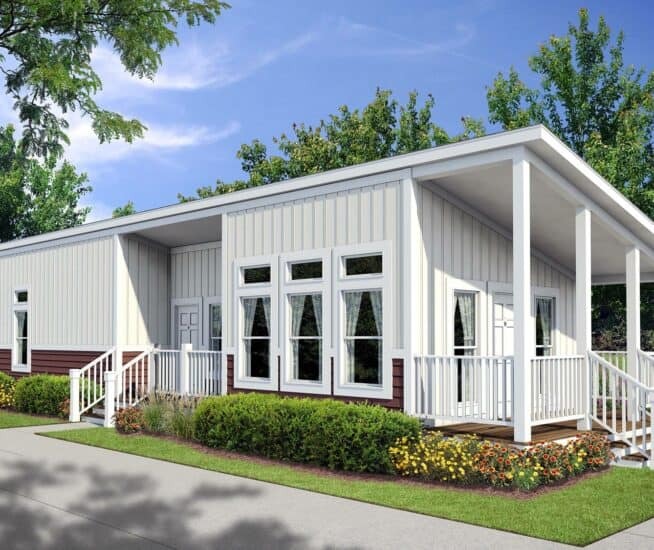 I would highly recommend Pratt Homes when you are looking for a new manufactured, modular, or Tiny Park Model home. They deliver as promised.” -Melissa W.